Here's a video that's as lovingly crafted as Kim's new bike itself! Highlights include: Kim's first test ride, Elsa & Kim trying on a Rivendell cap, Betty's arrival at our house, our first family ride, avoiding a baby in the street, and a slide show of the details. Go to Youtube to watch in all of its HD splendor! 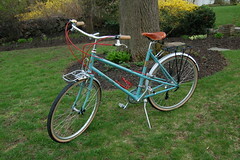 At long last, Kim took delivery of her shiny new Rivendell Betty Foy! It was worth the wait. She's only taken it for a couple short spins, but she adores the ride and the look. As the photo shows, it has a nice upright position, but there's plenty of scope to lower the quill stem if she wants to do that later. It ended up pretty much like we'd originally specced it, with a few exceptions. She really wanted a front rack/basket, so we got a tidy little Nitto rack, and we'll have the choice of a Wald basket or a little bag, depending on whether we're riding town or country. The other change from the original spec is that we went with Nitto Dove handlebars instead of Albatross - they're more compact (and much less expensive! ), much better-proportioned to the bike and its rider. 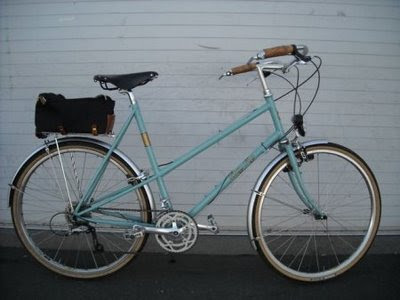 The rear rack was a big question, and the black Blackburn rack that's on there now is clearly not consistent with the Betty/Riv aesthetic.... But she'll need to carry a passenger, and this happens to be the best compromise - the rack serves its luggage-carrying purpose with aplomb, and the Elsie's child seat can snap right on when needed without any further rigmarole. We're planning our first big ride into the country for next weekend - we'll call the babysitters tomorrow! There are lots more photos on Flickr, and a nice YouTube video is in the works! BTW: Elton at Harris Cyclery in West Newton was great throughout this process! Very knowledgeable and enthusiastic! Gemma loves climbing up into the driver's seat. One day she'll reach the pedals! Elsa's a willing passenger too. Yesterday, at last, Kim, the girls, and I went to Harris Cyclery where they've got a Betty Foy frame on hold for us. I'd been corresponding with sales guy Elton, who said they were building one up as a floor model, and she could test ride that. Elton wasn't there, but we had a good time talking with Jim. He set her off on a test ride - not too long, though, since rain was threatening. Plus, this was her first experience with non-hub-gears for ages and she was still getting the feel for it. 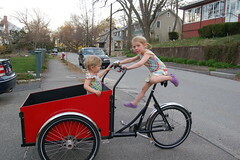 For the sake of comparison, she also tried a couple hybridy bikes - a Jamis and Giant, I think. She said they were a bit nippier, but didn't shift as crisply. And of course, they're completely lacking in the personality of Betty. So Betty Foy it is. We talked through some of the details with Jim, but we'll finalize everything with Elton via email this week. With any luck, we'll have it by Easter! Still undecided: Saddle & pedals. Maybe bars too. The thing about saddles is that Brooks certainly look the part, but they're also vulnerable to rain. And Kim prefers an upright riding position, so she'll be putting more weight on the saddle than I put on my B17. Does that mean she should have a saddle with springs? I'm a little nervous about that because Elsie will be a passenger at times, and I'd hate to have her little fingers get pinched. Also, it might take her a while to break it in... so I'd rather spare her the rigmarole if possible. What alternatives are there, I wonder? As for pedals, it's going to be platforms. There are various quill-sorts by MKS and others, but they aren't too sneaker friendly with the narrow contact points. I do like the Grip Kings, but they're a little odd, and a little dear. The pedals we've got on our German commuter bikes have good surfaces and built-in reflectors, and I think something like that would be just fine. Just gotta find them now. I think they're something like these bargain Wellgos. Or maybe something like these red Easterns? As for bars, the Pyramid North Roads are similar to Nitto's Albatross bars, but not quite as wide. But they are definitely more swept back than the bars Kim's used to. I may send Elton a photo of her current pedals & bars and see if there's something similar he can find for Betty. Will post pics & further developments as they come.